At Rome’s main train station today, the Stazione Termini, there was unveiled a 5 meter high bronze statue of Bl. John Paul. What do you think of this statue? Romans are divided, but not equally divided. Chose your answer and leave a comment in the combox. 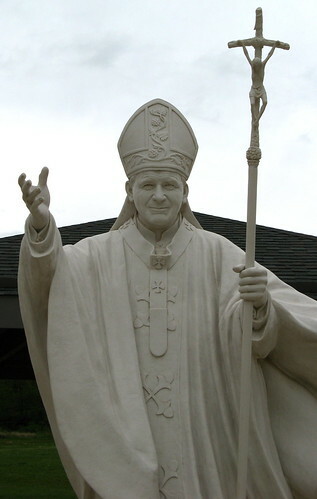 What do you think of the statue of John Paul II? The Roman daily of Corriere della Sera has a poll of its own. HERE. This entry was posted in POLLS and tagged Bl. John Paul II, statue, Stazione Termini. Bookmark the permalink. Father Z, please tell us this is a joke; this is either a refrigerator with the door opened or a busted portable toilette, with a disembodied head perched atop. Sad. Or maybe I just do not appreciate “art”. UGH! I’m tearing what is left of my hair out! If you erect a statue of someone that looks like that, it is difficult to tell weather you liked him, or you did not. Even 2,000 years ago, when mass produced art meant taking a sculpture of your head and sticking it onto a stock body, they took more care and showed more respect than this piece of…ahem…”art” does. Fourth graders with clay could have done Bl. JPII more honor. A disgrace. Seriously, I must not be able to appreciate “art” either, because I think it’s awful. I suppose there is a ‘spirit of V2’ explanation but I’d rather not know it. Ghastly is far too mild. Melt it down, subito! Ugh, it’s hideous… it reminds me of the original Charlie and the Chocolate Factory movie when Violet Beauregarde turned into a blueberry. Are they trying to say that they think he was an empty shell of a man? Perhaps they are saying that he was full of hot air? Ghastly is too mild a word for what I think of that statue. JPII was big in ecumenism, perhaps this is why they made it a sort of protection for all to be sheltered)??? If this is the case, perhaps a sign is needed explaining this??? I think I know what they (whoever they are) were trying to depict, but wow…that’s ghastly. Guess if I go back to Rome, I will…avoid it like the Termini. Sadly, it looks like a piece of clay after the grandkids have taken some out to play with, and then somebody stuck a doll head on top. I would not know who it was supposed to be had I not been told. Wasn’t this erected by sedevacanisti? That’s not the JPII statue. That is a set from an upcoming film adaptation of 1984 and that’s a statue of big brother. Where I come from we have a hollow tree stump that people can stand inside and get thier picture taken. Then again it seems painfully obvious that Marty Haugen was a consultant on the theme: Gather us in! I love the first guy… evil, evil, evil! I guess that’s a vote NO. I also love the looks on everybody’s faces- Like something REALLY smells horrible! This is a bus shelter! Look at all the busses driving around. It looks like a Martian overlord. I find the enormous scale of the statue unseemly, to be honest. It reminds me more of Mussolini than it does John Paul II; it has that sort of bleak, intimidating fascist quality about it. I understand the artist’s need to express, somehow, this man’s enormity in history, and this statue certainly does that, but it doesn’t seem to also express anything about the subject that caused the world to love him: the pope’s warmth, humour, compassion, piety, and so on. I find the statue unfortunate. That is the word I would use to describe it. Lacking that as an option I voted “not good”, but I stopped short of “ghastly”. To call it “ghastly” seems too philistine; there is some artistic merit to it, after all. I don’t question the execution, but the concept…and, of course, the scale. Because only 2% of voters say they love it, I conclude that the rad trad JPII-haters don’t WTRPS now (if they ever did). Why can’t sculptors-or just artists in general-make something NICE for a change? Why does it always have to look so ugly? There was a really nice statue of Blessed John Paul on the Via della Conciliazone, showing him with his arms outstretched in a gesture of welcome. Why couldn’t the railway people get that statue and put it up on a small pedestal instead? Piero Marini. What a sculptor! It looks like Cardinal Dziwisz’s head, not Blessed JPII’s. What happened to the glory that was Rome? Someone has a new place to sleep. How do you say, “What were they thinking?” in Italian? Seriously – what’s the point of this? To scare the cr-p out of little children? Be good or Blessed JP will get you? Is it supposed to look as though he’s “flashing” everybody? Unfortunately it does, albeit with an invisible body. What an amazing likeness………….of Otto Preminger perched on an open refrigerator. Ghastly! JPII the Great presented as JPII the Hut? Or perhaps Baron Vladimir Harkonen from DUNE. He holds open his cloak, reminiscent of his reliance on Mary who covers us all with her cloak. He invites us into the shelter. And it would be really cool to be used as a shelter. This statue really is terrible. The concept is crass, the execution poor, the overall effect monumentally ugly. It is an insult to the new Blessed and a nasty excrescence on a beautiful city. I fear also that it is destined to be used by all-comers as a Portaloo, as that it is what it most resembles. Perhaps his canonisation could be celebrated by melting this thing down and casting something worthy – another reason to say “santo subito”! What are these people trying to pass as Catholicism??? JPII deserves better than this! Now people at Rome’s train station don’t need to go to a modern museum to see ugly, debase art. It’s hard to believe that this came from the same land that produced Michelangelo and Bernini. But then again, that sculpture of the Resurection in the Paul VI Audience Hall is grotesque, too. The Corriere della Sera poll is interesting, though: 91% of those responding disliked it. At least the ordinary folks still have some buon gusto. Three words: UGLY AS SIN. I voted Not Good. I did not vote Ghastly because it could have been much, much worse. Taking shelter under Bl. John Paul’s cloak? I don’t think so. A much better, and more iconographic depiction of the same concept would have a sculpture of the Blessed Virgin, where people could find shelter under her cloak. Bl. John Paul could be depicted nearby in another sculpture, on his knees venerating the Virgin. You left out the “You gotta be s$#^$in’ me!” option. Legisperitus — I had a similar reaction. My first thought was that it looks like a dirty old man holding open his raincoat and exposing himself. Yuck! A few things going on with this work of ….umm… art? Agree with some above commenters: It has disturbing Soviet Era dimensions to it… more reminiscent of the huge works in public squares in Moscow than with Italian, let alone CATHOLIC art. The “stern” quality of the texture and color are also suggestive of the Socialist aesthetics seen in public art throughout the Iron Curtain countries during the Soviet era. It is absolutely scandalous that such an aesthetic would be used in a depiction of John Paul II who spent his entire life fighting for the end of those very ideals. 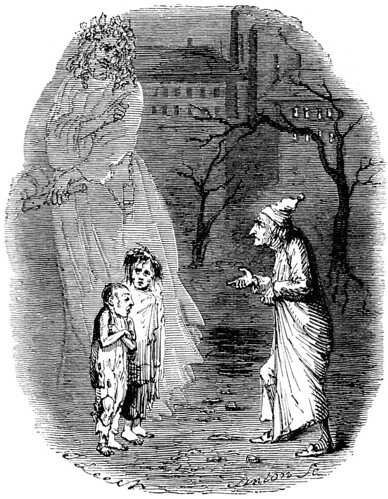 On a less serious note… it reminds me of the depiction of the “Ghost of Christmas Yet to Come” in “Scrooged” with Bill Murray… the hollow shrouded figure inside of which hid the skeleton-like children. Ghastly in the truest sense of the word. At the unveiling do you suppose the sculptor said, “@#@%%$ $%^%$##, they forgot the body!! !” In Italian, of course. Where is the “Terribad” option? Ah! A statue worthy of his pontificate. Most of these post-modern works of art and architecture (Rules? What rules?) will end up in the dustbins of history, which is sad, because we have wasted so many opportunities to grant our descendants something good, something beautiful. “Any ol’ pope in a storm”… if you can “cope” with it until the storm passes. As for me, I’d brave the rain rather than subject myself to this shabby shelter. Umm…the head looks more like the head of the bald guy they interviewed. I’m sorry. Modern art just doesn’t do it for me. This isn’t just ghastly, it’s abhorrently ghastly. Since the statue is supposed to depict BL JPII welcoming people to the city as they arrive at Termini, why is it posed with his back turned to the train station? And the head is very poorly executed…from the back view, the head and neck are very blocky and rigid – it looks more like a robot than a man. ‘Ghastly’ verges on too charitable. What’s the Italian word for ghastly so I can vote on the Italian site ? I hope someone can get their money back. Is that a homeless shelter? It made me laugh, then I remembered what we were looking at and it made me cry. Put the veil back on. The statue is silly. Fifteen years ago a marble one by Kuzma Kovačić was erected in Selca, a small town on the island of Brač, Croatia. Much better. It looks like it was designed by the same “artist” who designed JPII’s hideous papal crucifix – the one where Jesus looks like Gumby. Pre-school play dough version of something or other. I wonder how much dough the non artist received for this non art? I think even Blessed JPII himself wouldn’t like it. His motto was “Totus Tuus” and it’s HER virginal mantle of protection we should be seeking, not some weird statue’s “mantle” – IF that’s what it’s supposed to be! Personally, I think it looks like a bloated Paul VI, it certainly looks nothing like our beloved John Paul II! Melt it down and start again! I should add that religious art should lead us to prayer. That statue is far too ridiculous to lead anyone into prayer! John Paul II we love you!! ? He’s empty. Was the sculptor trying to make a point? Abhorrently ghastly is right. And the face looks more like Alfred Hitchcock than BlJPII. If there was a vote worse than ghastly, I’d click it. Dare I say … … well, let’s say any …limited support JPII gave to traddys would repaid with better art. I suppose that I will be the only one to say that I like the concept…but the execution is indeed a failure. If one is to create a sculpture that is minimal and symbolic in it’s simplicity, the singular identifying element: JP II’s face, should at least look like him…or capture a gesture that evokes his comportment. Also, the overall form of the sculpture is graceless, resembling a 2 liter soda bottle. If the artist had elegantly sculpted a draped cloak, it could have been effective…but overall, this is a fiasco. I wish that I could have understood the words of the obviously disappointed Roman citizens. I had the same thought about Pope Paul VI (who, incidentally, as an avid connoisseur of modern art, would have admired this statue). It does remind me more of Paul: cerebral, cold, intangible, indiscernable, impenetrable, perplexing, shadowy…these are all moods I find expressed by this statue. The open mantle does not, to me, seem to successfully convey John Paul’s openness, which I think the artist aspired to depict. As others have observed, it conveys vacancy and emptiness, instead, seeming more like an unjust indictment than a celebration. It’s not a sculpture of JPII, it’s a giant replica of an excavated Etruscan helmet. When you look at it that way, it’s not a bad piece. You were right the first time: the papal staff or ferula is not, properly speaking, a crozier. Okay, it’s an obvious resemblance. Me thinkseth it mighteth been the artist’s inspiration. I saw something almost identical in the film Monty Python’s Meaning of Life. You know, the part where the glutton, who has been gorging himself throughout the film, takes one more little morsel and suddenly explodes, leaving just a head and a blown out ribcage? This one, though, is not as funny. a. It is consummately UGLY! b. The face looks only vaguely like Bl. John Paul II. c. Why did the artist not finish it? d. What is the artist trying to communicate with the vacuous chamber where the body should be? e. There is no sense in which I would consider such an emesis as that to be art! My husband thinks it looks like a propane tank. Well, it won’t be desecrated, anyway. It CAN’T be, it is already a desecration! Hideous. This certainly cannot be called art. I wouldn’t have guessed in a million years that the image was of Blessed John Paul II. Let’s all pray for a miracle (for his canonization, no less) that the image is transformed in the night into something of beauty and fitting for this great man! When I saw this it carried me back to my first sight of the Morlock sphinx in The Time Machine. It’s that creepy. Reminds me of the three-headed giant from Monty Python and the Holy Grail. I’m guessing the point was not just to have something to look at, but something participatory (I’m assuming you’re allowed to walk around inside it). I “get it”)…it could be worse, but could be better (a lot better). Spot on MA. I’d only quibble with “b. The face looks only vaguely like Bl. John Paul II.” I’ve seen some close-ups of the face which I can’t seem to locate, but they look nothing like JPII and more like Marlon Brando at his worst. I guess I’m of the 1% that like it. This is not the Renaissance or the High Gothic grandee. This is a monument to Tor Johnson co-star of Ed Wood’s “Plan Nine from Outer Space” and one of my favorite guilty pleasures. I’m touched that Rome would seem fit to honor such an arcane subject. Disgusting, horrible, detestable, mockery, sacrilegious, and other less nice things to day. I’m like most here, and I guess like the Romans, and can’t understand art. Though I feel that the peak of human artistic creativity was the Renaissance, and it has been all down hill since then. Didn’t I see this contraption in an Austin Powers movie? It looks just as much like Dr. Evil as Bl. John Paul II. I’d give Dr. Evil all the billions of dollars he wants if it meant he would get rid of this thing. Give me a “laser” to aid in the demolition. How many papacies could you go back if you filled the center with matching but successively smaller matryoshka pope statues? Though I feel that the peak of human artistic creativity was the Renaissance, and it has been all down hill since then. In way, (don’t shoot me!) this almost makes sense. The 20th-century was the era of deliberately ugly art, and JPII was pope through much of it, so the statue works in the sense of a parting shot or final insult by artists hostile to beauty. @Digdigby: Too funny with the Tor Johnson likeness! Well, no offense to Europeans, but isn’t this European art at its best?! I mean, come on! JPII was a beautiful, faith-filled human embodiment of Catholicity! Any statue or picture or painting should reflect that beauty. What this is reflecting is anybody’s guess! Please put something else up, Fr. Z… Anything. Fishwrap, birds, anything. I check back to your website frequently and all I see is that hideous parody of a statue. “The Hollow Man” — “The Men Without Chests” — T. S. Elliot and C. S. Lewis would know exactly what this meant. SHAME. Um, my first thoughts were really bad, so I’ll keep those to myself.. but it will make a nice shelter for the homeless and other folks out by the train station! Clearly, the “spirit of VII” was invoked. I just noticed how big the forehead is…It looks……encephalitic. To be fair, it does look better from the side where you can’t see the vast emptiness inside. But, better is relative. Even from that angle it still looks like part-hawk, part-pope, part-waste-of-bronze. So apparently, openness = emptiness? The announcer on the video says that the statue was meant to evoke the time that JPII spread his cloak wide to envelop a little boy. I saw the video of that event, which was lovely and glad. This statue, as another onlooker said, was just . . . . sad (triste). Not to mention bad, bad, bad . The face doesn’t even look like him. Scrap this monstrosity and start over! This almost makes me want to become a Protestant. Horrible. An insult to the memory of Blessed John Paul II. I find it ghastly, yet entirely fitting for a pope who telecast horrendous liturgies the world over, and supported the construction of incredibly ugly churches. Kind of reminds me of Captain Pike from Star Trek after his accident….just odd. Ghastly! That is horrible. It looks like something pre-schoolers would make with play dough. The children would do a better job. Horrendous – it doesn’t even look like Blessed John Paul II! It looks like a beach hut with a head on it. I can imagine tourists will be tempted to pose inside it for their friends to take photos and the inevitable grafitti will appear on its walls. I voted ‘Ghastly’ and agree with the chap who said ‘male, male, male!’ Some of those watching look positively stunned. How sad. It would be better just to have had the head on a plinth if the sculptor was not able to sculpt a decent body. The artistic fashion that would have made this statue look artistic or modern went out of style at least 20 years ago. What is sad here is seeing the poor Cardinal there, forcing a smile. He must have been thinking, “Dear God, let this end and get me out of here. I lost the bet/pulled the smallest straw, so here I am.” An absolutely terrible structure. Reminds me more of the iron maiden torture device. Nothing brings out the commenters like ugly art! Cardinal Agostino Vallini, vicar of Rome. I guess I’ll have to pay more attention to those people who used to call Bl. JPII a gutless wonder. It seems as if they can see the future! I would not have realized it was Bl. John Paul II if I had not been told so. I think it capturesperfectly the essence of the papacy of His Holiness, so recently deceased. At the same time, I don’t know that it captures his person properly. albinus1 says: Legisperitus — I had a similar reaction. My first thought was that it looks like a dirty old man holding open his raincoat and exposing himself. Yuck! If Bill Maher were to take cover in there, the dreadful image would be complete. Wow. Just wow. The statue is ugly, but not as ugly as the group of cheap shots at the Holy Father here. If someone said that Pope John Paul II liked chocolate, there’d be some bitter fruit here chiming in, trying to make a link, any link, on how he was a bad pope and responsible for every bad thing in the Church today. They couldn’t come up with something that looks similar to the Renaissance art found in Rome? It looks like the head from “The Wizard of Oz”. Chris Garton-Zavesky: what do you think “the essence” of his papacy was and what was “his person”? It’s Play-Doh, apparently a brand owned by Hasbro, but I can find no registered trademark. Yes, the project under discussion should have come to a halt at that stage. The result is a gross misuse of metal. random friar, was I the only one that even tried to like it? I like chocolate too, by the way. Even bitter chocolate. Oh dear. One of the most mysterious and beloved images / visions of both the Eastern and Western Church and the ultimate vision is of ALL Christians gathered under Her cloak. Little Therese herself had a vision of being taken under Immaculata’s cloak. This image should NEVER be used outside of the hyperdulia of the Virgin Mary. Can anyone else find another example of this image being used outside of Her cult? I really shouldn’t offer an opinion until it’s done. well, Blessed John Paul II was famous for telling us to ‘BE NOT AFRAID’, but I don’t think he ever thought one would need to use the phrase in reference to a statue of himself. I much prefer the beautiful bronze statues of BJPII and 2 youth created by a Polish couple for our parish (Immaculate Heart of Mary, Los Alamos, NM) – it was dedicated on May 1. You can see the sketch of the statues on our website: http://ihmcc.org/JPII_Memorial.html There is a slideshow also, but unfortunately doesn’t seem to be a very good shot of the statue posted right now. My first thought was “Oh my God” and it was a prayer. What in the name of sam hill were they thinking of!!??? Next, roflol. I meant it is what we would rather rudely say, fugly. We defeated communism. Brutalism is passe. Margaret at 6:20 – You deserve the Gold Star! Quaeritur Who commissioned that monstrosity? Fire him/her/them/whomever! Fire whomever it was that okayed it, as well. Awful, just awful. Art should be awe-ful. The head bears no resemblance in the least to Blessed JPII. My grandkids would say it stinks. Moving right along, it’s not uncommon to see depictions of women saints who are either founders of orders, or known for their charity, gathering people under their cloaks. You don’t normally see the people depicted quite as tiny as with Mary, but that sort of thing is out there. I’ve also seen a few male founders depicted this way, and I think one picture of St. Francis with a bunch of different Franciscan folks of different orders clustered under his cloak. But it’s not as common with guys, of course. The problem with this statue is that it is not beautiful or cute, but ugly. I say, slap some paint on it to make it cute, or remove it to make it gone. Margaret, your comment was THE BEST! Father Z, you have left this up ALL DAY. Have pity… please!! There HAS to be something else that needs our attention today. Bring out the Holy Hand Grenade! I think Parochus is on to something: put it in the Paul VI Audience Hall. Looks like Uncle Fester of Addams Family. YUK! It presents Blessed John Paul as a hollowed-out Dalek! (Or a very strange bus shelter.) Back to studio! Hideous. Just hideous. What an affront to our late Holy Father! Didn’t anybody approve this montrosity before it was sculpted….or would that have offended the “artistic” sensibilities of the so-called artist? The artist should have quit while he was a head. Ha, ha – it does look like Uncle Fester! You people are far too critical!!! This is just another example of Roman thoughtfulness, and as usual you all miss the boat! The large cavity where the corpus of Bl. John Paul II should be, is merely a modern bus shelter, where one may wait for the bus or cab if weather is inclement…. Ha, ha, I’m kidding. The Romans are great aren’t they? Even when they are shocked, they come across with class as they show their displeasure. I think it’s the most amusing thing built on Vatican Hill since Caligula’s circus. Stazione Termini is not on Vatican Hill but across the Tiber on one of the 7 hills (Viminale). Thanks, robtbrown; I read too quickly (or not at all) and thought this was at the Vatican railway station mentioned earlier in the week. I don’t know where that is in Vatican City, incidentally; illuminate me? I still love the statue for all it will come to represent. Nothing I say could surpass what those nice old Italian men & women said in the video clip. It reminds me of the Fat Guy in The Meaning of Life – except I want the bucket! “dirtycopper” posted that it resembled the Baron from the movie DUNE. I laughed so hard, but that is definitely accurate now that I think about it. Hideous. That’s all. Just hideous. Ugh! Looks like his head is popping out of a hollowed-out cocoon! kallman, you said “IT shows a Pope decapitated by the empty heresy of modernism” – well stated…I was thinking about adding a similar comment but I think you captured my thought. Wow, I’ve got to start editing myself – what a terrible sentence! kallman, let’s just say I agree with your comment! I also think there are some really, really funny comments, esp. from priest-readers – thanks for that, Fathers! Bland, and despite what they call art it falls into the category of many, many people can duplicate this. Does that make them an artist? Build Versailles today, I might call you an artist…A former Pope who had a knack for liking and choosing the most ugly modern “pieces of art” may like this one. But for me it is gross. Full disclosure – I was born in the 60’s, I think that Paul VI and Bl. JPII and all their coterie have CHEATED ME out of my just inheritance through all the BLATANT INNOVATION at and after Vatican Council II, and I attend only the “ordinary form”, and I know only the latin I was able to teach myself, way to go bishops. I never met the man, and I hear he was truly wonderful, but may have suffered from the issue on another post here where he is called to say unpalatable things, and didn’t. I do think his cause is politically motivated by the crowd whom Plinio Correa de Oliveira would have called “the Revolution” to advance one of their own, and I fully expect they will push to have him declared a Doctor of the Church to show how great the Council was, regardless of any merit. I think an honest assessment of his papacy would score him as notable only for his longevity, and otherwise lost in the middle of the elite company. As for that “fixture”, it is an insult to the man, but a perfect testament to his age. He is the door? Isn’t Christ the door? So it’s not only ghastly, but blasphemous as well? Or is he the new “Fridge”, demoting William “the Refrigerator” Perry? Looks demonically inspired. Not only is it a mockery of JPII it is a perversion of the human form in general. It is empty of inspiration as its vacant interior. A hollow gesture. I’d laugh if it were worth the effort. Ok, I’ll reveal a little of myself – I do like some modern art. I can often appreciate what it’s trying to do – and sometimes it’s trying to do something good, finding the truth in looking at things differently. To me, this is neither extreme – it’s not trash, it’s just bad – almost intentionally so? The artist has no skill with the material, and the statue doesn’t even make a good bus shelter. Almost a parody of art. If one has to explain art – that’s bad enough. If the average person to a man says it’s bad, that’s damning evidence in and of itself. There is much about the composition and the use of material I find attractive. But to call this exercise in artistic and metallurgical technique a tribute to the late pope is ghastly. This monster is another pathetic attempt of letting us believe that if something is beautiful, or not controversial, or even halfway to be looked at, it cannot be “art”. The kids have made better snowmen. It doesn’t matter how artsyfartsily you delve into its ‘meaning’ for the ‘artist’ and what his ‘vision’ was, it’s never going to be anything other than JUST AWFUL. So melt it down, and start again. I think that the artist is having a lend of the people who paid for that monstrosity. Ugly is not the new beautiful. It’s… it’s… it’s… it’s no use. My English fails me. Yes, it’s ugly, but am I the only one not shocked? It is aesthetically in keeping with some of the liturgies he presided over and many of the churches built in his pontificate. I’m sorry people, but the good taste of the current pontiff can’t seep into the past and cover the rubbish that passed of sacred art during the reign of the last one. This is, I think, a actually fitting memorial of at least part of his legacy. I guess I understand the intended point: John Paul II tried to gather everyone underneath his protective cloak. At the same time, UGH!! Looks more like a really bad Buddha than a statue of John Paul II. I’d like to see a regular statue of the man, thanks! I voted ghastly. I don’t like neo-brutalism (my term). And veils : ) ! The item’s appearance reminds me of a character from original Star Trek: Gorgan. I find neither the Gorgan nor the metal item to be a fair characterization of Bl. Joannes Paulus II. I think part of the problem is the pathetic lack of talent the artist had combined with the artist’s chosen symbolism. In classic art, symbolism could be subtle, and yet carry the message powerfully. But then that took talent and skill. This artist has no skill, so to bring out his ‘symbolism’, he basically has to beat viewers over the head with an 8 pound sledge. OK, after further viewing of it, I have to say that I don’t think an artist made this. I think some shipping company donated this after pulling it out of the rocks on R’lyeh the last time that island was above the surface of the ocean. teaguytom@ 5:24-I clicked on the link you had on your comment, and that statue looks really nice! At least that one looks like Blessed John Paul II! This…thing…is just hideous, and creepy to boot! On another note, I love how those people over there tell us Americans we have no culture. We have a culture; it’s the one y’all are throwing away with both hands. 1. Don’t artists usually finish their work BEFORE unveiling it ? 2. What a waste of bronze ! 3. If anyone has a spare hand grenade. I have use for it. My granddaughter could have done better with playdoh. Melt it down and sell the bronze to feed the poor. I am sure it what JPII would have wanted. Having lived in Rome, I can guarantee you that some homeless person will try to set up his residence inside as soon as it seems safe. The artist surely knew this too. I suspect it’s intentional: the “work of art” as you see it isn’t complete because the resident is missing. He might even put up a sheet to cover the entrance. Avemaria says: The large cavity where the corpus of Bl. John Paul II should be, is merely a modern bus shelter, where one may wait for the bus or cab if weather is inclement…. Pray there is no lightening! Oh no, it’s good art. I really like what the artist says in this piece about the institution of the papacy. Oh, no, it’s not good art. The artist had no such intention, he’s just so incompetent that you are able to read into it what you think without any interference. Art as “tabula rasa” is one of the biggest frauds that ‘modern art’ has perpetrated on both the innocent and the not-so-innocent. It’s so sad to see him depicted this way! As others have said…Hideous!!!! I saw the title I envisioned a beautiful, life sized statue with detail and taste. I assumed it would be something that exuded his persona, his presence. I couldn’t have been more wrong. It’s good to hear that OR and Rome’s mayor have both spoken out. The mayor’s comment about taking the voice of the people into consideration is important. It’s especially noteworthy that the resemblance to Mussolini or any association with the Fascist concept of art and architecture is being mentioned. On my 2010 tour of several Italian cities, our architecture-savvy Italian guide was most acerbic in his comments on the relics of that era. Since I can’t imagine the Romans will agree to live next to any bronze of John Paul II that, however unintentionally, through the ineptitude of the sculptor, calls Il Duce to mind, I’m willing to predict it will disappear before many months go by. This statue is very unpleasant, though not quite so bad as it could have been. In other unpleasant news, I encountered the dreaded Platitude Cookie at lunch today. I agree with the others who think it looks like Uncle Fester from the Addam’s family…. If nobody told me it was supposed to be JPII I’d have been wondering why Uncle Fester deserved a statue in Rome. Does “Fuso Subito” mean “Dynamite it now”? If so, I wholeheartedly agree! I wonder if that was the artist’s intention too. Wonder if he had to submit a sketch. Even funnier and maybe more tragic, huh? Looks like a good place to talk on the cell phone and smoke a cigarette in Rome to me. On the other hand, it’s too small to serve coffee and a little restrictive for talking with one’s hands. Not much room to pace around and yell. Wonder if it has an echo. Yikes! A new fashion in lightning rods? On the other hand, with a little tin foil it could be a Faraday cage! The mind boggles.